Staples' Charles Lomanto, with ball, gets taken down y several players near the endzone, during spring football game action at Staples in Westport, Conn. on Friday June 14, 2013. 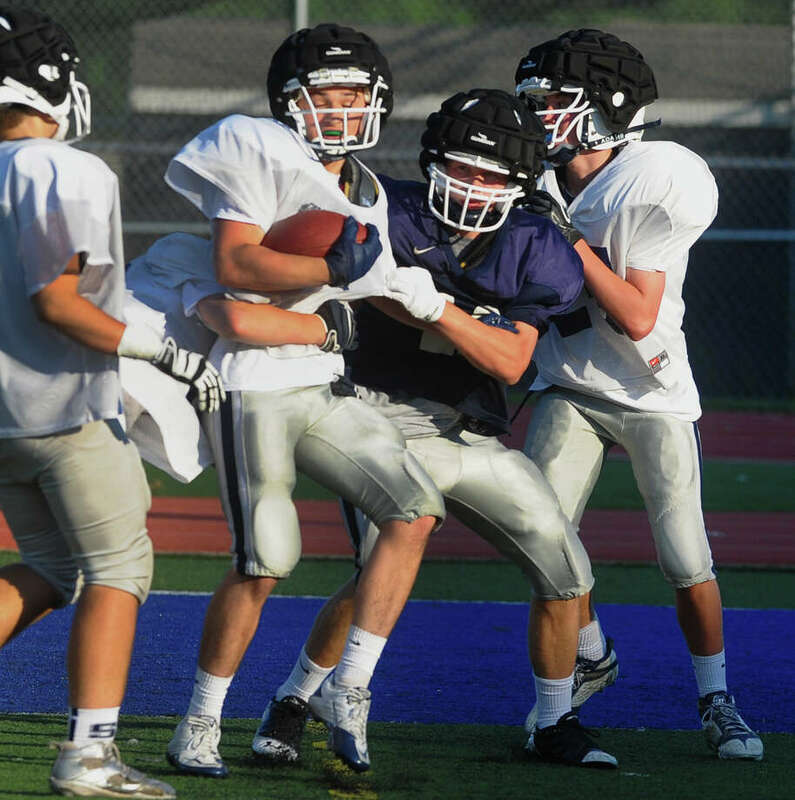 Westport is at the forefront of two initiatives to reduce concussions in football. With concussions developing into a serious issue, significant attention has been directed toward protecting the brain. Westport PAL is working with Triax Technologies to collect data on the impact of collisions. Triax has developed a sensor, which weighs eight ounces, that goes underneath an athlete's headband. The Smart Impact Monitors are wirelessly hooked up to a computer application on the sideline; the whole team is on one page and each collision adds up. Hits of 20 g's or above, a threshold determined by neurologists, are registered. Each sensor costs $99 and has a 17-hour battery life before it needs to be recharged. At the same time, Staples High School is testing padded helmet covers during practice designed to reduce the impact of blows to the head. Concussions have become a particular concern in football, where hits to the head can be frequent. According to the Sports Concussion Institute, a professional football player receives up to an estimated 1,500 blows to the head during a season. The SCI also reported that between 5-10 percent of athletes in all sports will experience a concussion in a season. "We are looking to work with the company and get some data and see how we can use that data to make kids safer and play the game a lot better," Westport PAL president Carmen Roda said. "We liked what we saw, and as people know Westport has been a leader in concussion management for years." The Westport PAL has done extensive work in making football a safer game for its youth. It has implemented an extensive concussion policy -- based on the popular Return to Play model -- aimed to make sure a student-athlete doesn't return to the field until completely symptom-free. Tackling clinics run by Staples head coach Marce Petroccio are aimed to improve skills as well as safety. "(Roda) was one of the first individuals to take interest in what we were doing, and he allowed us to do our first beta test with his seventh or eighth grade group last summer," Hunter Hollingsworth of Triax said. "It was early stages but now we are finished and are going out and doing more testing." The Mayo Clinic defines a concussion as a "traumatic brain injury that alters the way your brain functions." The cumulative effect of such blows is glaring and if not treated properly, the brain can be harmed permanently. The University of New Haven became the first college in the nation to use the Triax product. The school will use the sensors in football and both men's and women's soccer. The data can be stored for multiple years, allowing teams to have a complete history on each particular athlete. "We really treat this as an information protocol," said Dale Hollingsworth, one of the founders of Triax. "We really want to teach to the data. We are looking for information; these are like eyes in the sky." This summer Staples became the first high school in the state to install Guardian Caps. The caps, which cost $55, were first developed in 2010 and have been tested in limited numbers since. Those numbers are rising however and the helmet covers are rapidly gaining popularity. The caps have been used in every Wreckers practice, but will not be on the field during games. "The reaction has been great," Petroccio said. "There have been no injuries, no head injuries; we haven't had any concussions so I'm very pleased. What we are doing is great." A June study conducted by a pair of universities, Pittsburgh and Cornell, found that a player is 26 times more likely to suffer an injury in a game. The decision to use the Guardian Caps solely in practice is a positive step in the right direction, Petroccio believes. "It's early in the game, we have to file and do the data and figure out exactly how they work and how they can improve on them, but so far for us it's been good," Petroccio said. While it's unlikely there are more collisions than there were 10 years ago, awareness is certainly much higher. According to the federal Centers for Disease Control, 53 percent of athletes have sustained a concussion before they reach high school. Furthermore, nearly half of players that have concussions do not experience symptoms immediately following the collision, highlighting the need for external monitoring. "It's early stages but everything seems positive," Roda said. "The more information we can get to make the game safer and the make the sport as safe as possible, we will get more positive feedback."